Although they lead to exciting new skills, wonder weeks can be trying for parents and children alike. Dutch doctors Frans Plooj & Dr Hetty van de Rijt came up with the term ‘wonder weeks’ to describe the mental developmental leaps babies experience in their first 20 months of life. These leaps occur at 10 specific times, and Piloj and van de Rijt found that the leaps they were related to brain and nervous system changes, enabling babies to broaden their perceptual and sensory awareness after each leap. A baby responds to stimuli early, starting in utero by distinguishing sound so certain voices can be recognised after leaving the womb – but they still experience sound, sight, taste, touch and smell as one overall sensation at birth. But with each mental leap, babies are able to use each of their senses in more deliberate ways. Piloj and van de Rijt also found that these mental developmental leaps are accompanied by difficult periods, with crying, clinginess and crankiness, and often with increased hunger or a loss in appetite, as well as interrupted sleep. These times are followed by “sunny weeks”, when babies seem a lot happier. Many parents complain of their child having ongoing fussy phases, or that their child seems to regress every few weeks. Plooj and van de Rijt say this occurs because babies initially find their new abilities intimidating; they get frustrated when they don’t know how to control them, and can be overwhelmed by the new experience. Each of these regression periods lasts between seven days and four weeks. Babies can’t immediately master all the skills that become available to them after each leap – instead, they’ll focus on the things that interest them most and that they find simplest to do. Try to keep track of which skills your baby displays after a wonder week, and help him practice them. The pattern of a sunny week, followed by a fussy period, followed by the wonder week, will recur from five weeks right up until 20 months. To work out when to expect wonder weeks, you should use the baby’s expected due date, rather than the actual day of the birth, as babies born early or late may experience leaps at slightly different times. For this reason, premature babies will usually reach wonder weeks later than other babies. Here’s what can happen during these weeks. The world of changing sensations: As your baby’s metabolism develops, and has a growth spurt in head circumference, she’s able to notice more of what’s happening in the world. After this week, she’ll look at things more frequently, respond to touch differently, start to give ‘social smiles’, respond to smell, and be more alert during awake periods. A sunny week should follow at approximately week 6. The world of patterns: This wonder week helps babies to be able to recognise simple patterns to life, and the way these patterns apply to the way they can use their bodies and find familiarity in the people and objects they see. After this week, your baby will be able to hold her head more steadily, turn her head towards sound, shift her weight while sitting, start showing signs of grasping, feel toys without trying to grasp them, discover and observe parts of her body, look at patterns, and make short grunt-like sounds. A sunny week should follow at approximately week 10. The world of smooth transitions: This wonder week helps babies use their senses to distinguish order and constants in their surroundings, and the transitions in sound, movement, light, taste, smell and texture. New skills after this week include following something with her eyes and/or turning her head in a fluid motion, being more active and squirmy, being able to turn her body in different directions, rolling from tummy to back, shaking a rattle, starting to make noises such as screeching and cooing, gurgling and blowing raspberries, responding to something that intrigues her with a reaction such as laughter, showing interest in light, and liking to listen to sounds with various pitches. A sunny week should follow at approximately week 13. The world of events: Babies will be able to understand how series of events lead to outcomes, and experiment with how they can make events happen. After this week your baby will be even more active, have better grasping skills, put things in her mouth, make a lot of motion with toys and activity boards, look for mum and dad, respond to her image in a mirror, make consonant sounds, recognise her name, stop during a feed and push the breast or bottle away when no longer hungry, and show signs of impatience or boredom. A sunny week should follow at approximately 21 weeks. 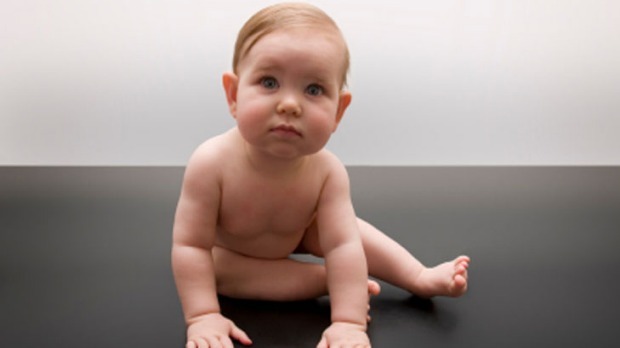 The world of relationships: Your baby’s mobility is helped by better coordination of her limbs. She can now tell the relationships between things. This is often when separation anxiety sets in, because babies are now able to perceive distance and feel isolated from their parents. After this week, she’ll be interested in the different ways people can act, be interested in small details, start to lift and throw things to explore what’s underneath them and what they can do, try to untie things, place food in other people’s mouths, understand how words can mean actions, blow air, make noises with her tongue, and pull up into a standing position, usually with assistance. A sunny week should follow at approximately 31 weeks. The world of categories: This week is key for babies being able to recognise that various things can be grouped or categorised together, each with distinguishing characteristics and properties, and a desire to explore them. After this week your child will demonstrate that she understands some words, recognises her own reflection and perhaps plays games of peekaboo with herself, imitate others, express her moods, like to play games and sing songs, and will start to practice crawling. A sunny week should follow at approximately 39 weeks. The world of sequences: Babies now start to comprehend sequences, and how there are various steps involved for tasks and putting things together. After this week your baby will be able answer simple questions, point at things, put together simple puzzles, know how to speak on the phone, stack rings, imitate gestures, and will occasionally try to dress herself. A sunny week should follow at approximately 49 weeks. The world of programs: This week follows on from your baby experimenting with sequences which are dependent on individual actions, and the repercussions of those actions, rather than straight repetition. Her new skills include understanding that getting dressed is a signal for activity, putting items away, showing preferences for things she wants to do, trying to draw, and using observation as a major tool for learning. A sunny week should follow at approximately 58 weeks. From theatricism to temper tantrums: Your child is now a toddler, and has a number of physical skills, can imitate and role play, use language to express emotion and to engage people, can use and understand humour, can negotiate and bargain, and tries to get her own way. Skills that can emerge after this week include expressing emotion in a number of ways (including tantrums), wanting to do things for herself, replaying domestic rituals, starting to consider and think about the future, understanding possession, and having some irrational fears. The world of systems: As they near 20 months of age, babies are capable of understanding systems and are able to modify behaviour to suit the circumstances. Your child will also start to develop empathy and be less egocentric, and will use art forms to express emotions, along with her better language skills. After this week she’ll act out to test boundaries, learn about ownership and sharing, start to develop a fuller understanding of the concept of time, and start to both speak and understand more when spoken to.